Mayor Rahm Emanuel, the Chicago Park District and the Chicago Blackhawks celebrated the official opening of the Chicago Blackhawks Hockey Rink at Kennedy Park in Chicago’s Morgan Park neighborhood. The new 80’ x 175’ rink features a SportCourt surface for both street and roller hockey use, creating accessibility across multiple seasons. The rink, located at 11320 S. Western Avenue, will serve as a public park amenity and will be programmed by the Chicago Park District. While the Chicago Blackhawks may hold occasional clinics and camps at the rink, its primary purpose is for residents to use at their own discretion. This is the first rink funded by the Blackhawks through the National Hockey League’s Industry Growth Fund (IGF) as part of an initiative to further develop youth hockey. The Blackhawks will continue to work with the Chicago Park District to find suitable locations to build more rinks in the future. 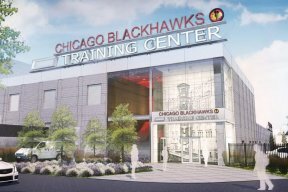 Next month, the Chicago Blackhawks will also open the MB Ice Arena – Chicago Blackhawks Community Rink, a new 125,000 square-foot community rink located two blocks south of the United Center at 1801 W. Jackson Blvd. in Chicago. The repurposed site at the old Malcolm X College will now be home to a $500 million academic campus at 301-339 S. Damen Ave. with four mixed-use buildings containing 1.4 million square feet of classrooms, offices, health clinics, retail space and 300 dormitory rooms. For more information about Blackhawks’ youth hockey programs, please visit chicagoblackhawks.com/community/youth-hockey. Additional information about Kennedy Park can also be found here: chicagoparkdistrict.com/parks/Kennedy-Park/.